The number one cause of skin cancer is overexposure to ultraviolet light. Although most individuals understand that this light comes from natural sunlight and tanning beds many do not understand the real precautions they must take to avoid this deadly disease. Preventing skin cancer involves more than just applying sunscreen at the pool and avoiding tanning salons. Real skin cancer prevention takes place everyday of the year in a variety of choices and habits. Although most individuals only associate skin cancer with sunburns received on hot summer days there are actually five main areas of prevention that you need to know about and understand. Most importantly, you need to avoid overexposure to the sun. Along with using sunscreen and protective clothing (which are both discussed below) you also need to limit your sun exposure during the strongest hours of the day. Seek shade or cool off indoors between the hours of 10:00 a.m. and 4:00 p.m. on summer days. Along with limiting your sun exposure during the summer you also need to be wary of cloudy days. Just because the sun isn't shining doesn't mean that your skin is not exposed to harmful UVA and UVB rays. Remember to use sunscreen on overcast or overly cloudy days if you will be spending long periods of time outdoors. The same principle applies to winter days. Ultraviolet light is still emitted by the sun during the winter months and this light can be reflected by snow and ice. Apply sunscreen before heading out to make snowmen or enjoying a day at the slopes. Even if you limit your exposure to natural sunlight you can still develop skin cancer if you seek a tan from artificial light. Getting a tan is not a healthy endeavor. When skin tans it is showing damage. Avoid the use of tanning beds and lamps at all costs. Finally, pay attention to your skin type and other risks. Fair skinned people are more apt to receive damage from the rays of the sun. 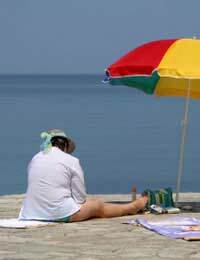 These individuals need to take extra precautions when attempting to prevent skin cancer. The same is true for individuals who take medications, like birth control pills, that can make the skin more sensitive to the harmful effects of the sun. Just understanding the need for sunscreen and protective clothing isn't enough if you do not know how to use them properly. The key to getting the most from your skin cancer prevention steps is knowledge. The two most important things to remember when using sunscreen are that it must contain an SPF (sun protection factor) of at least 15 and that you need to reapply it often. A sunscreen with an SPF under 15 will not provide adequate protection for even small amounts of exposure. Choose a sunscreen with a higher SPF for better protection and make sure that your sunscreen of choice provides protection from both UVA and UVB rays. To get the most protection from your sunscreen make sure that you apply it to every inch of exposed skin at least 30 minutes before you head outdoors. This includes any time you will be outside for an extended period, even if you are gardening, taking a walk, shopping at an outdoor market, exercising, or even waiting for a ride or the bus. This lead-time will give the sunscreen adequate time to soak in and begin offering protection. Also remember to apply the sunscreen to often-overlooked areas of the body such as the ears, lips, scalp, back of the neck, and feet. For boosted protection make sure that you reapply the sunscreen every 60 to 90 minutes while you are out in the sun. Reapply more frequently if you spend a lot of time in the water, dry off roughly with a towel, or sweat profusely. Finally, never use a sunscreen that has expired. If you have had your bottle of sunscreen for more than one year it is time to toss it and invest in a new bottle. Even with the use of sunscreen you are still at some risk for developing skin damage due to exposure to the sun. To boost your protection you need to add protective clothing to your skin cancer prevention efforts. Many people think that if they apply some sunscreen and wear a swimsuit they are adequately protected from skin cancer. However, this idea is just not true. Some clothing, especially swimsuits, do not provide the right type of skin protection. If you can see through your swimsuit or other protective clothing, UV rays can get through to your skin. If your clothing is thin, apply sunscreen to your skin before dressing. This is also true if your clothing gets wet. Water soaked clothing allows the penetration of UV rays more readily than dry clothing. To get the most protection from your clothing cover-ups choose darker colors (avoid white), tightly woven fabrics (avoid thin cotton t-shirts), and long-sleeved or long-legged shirts, shorts, and pants. Finally, remember that protective clothing doesn't end with pants and shirts. For greater protection, always wear a hat and sunglasses anytime you will be outdoors. Preventing skin cancer is a serious lifestyle endeavor and definitely one that should be passed on to your children. Make skin cancer prevention a habit in your life that you take very seriously and make sure that you set a good example that your children can follow. By instilling the importance of skin cancer prevention in your children at a young age you will make it easier for them to develop the right habits and keep those habits going strong well into their adult years.